For the first time in seven years, Adobe has released a beta version of its flagship image editor in advance of a formal product release. Photoshop CS6 beta is now available as a free download from Adobe Labs in English and Japanese. The commercial release will follow fairly soon—sometime within the first half of this year. You will be able to get Photoshop CS6 as part of a Creative Cloud subscription for $50 per month, based on a yearly subscription. However, prices for both standalone Photoshop CS6 and Photoshop CS6 Extended, and their upgrades, have yet to be announced. During the beta period, Adobe will preview the app and its many new features as it readies a fresh update of the rest of the suite—as well as its Creative Cloud—for debut. New Photoshop CS6 Content-Aware Move and the Patch Tool with new content-aware options. During that time, Adobe hopes that users will provide feedback on the new upgrade. Adobe says that by the second quarter, its entire slate of updated CS6 applications, including Photoshop and the Creative Cloud, will be in users’ hands. “The upcoming Photoshop CS6 beta has been informed by more research and voices in the community than ever before,” said Bryan O’Neil Hughes, Photoshop’s senior product manager. “This is a very user-directed release and we’re encouraging people to download the beta, experience it, and provide feedback.” Hughes said that Adobe sees this as an opportunity to share the beta with the people who helped validate much of the product's updated direction. “User feedback is always welcome and we have more avenues than ever for the community to give us feedback,” Hughes said. Photoshop CS6, as in the past few updates, comes in both regular and Extended versions and will offer an abundance of new features—60 percent more new features than the previous version, according to Hughes. In addition, the release will contain 65 user-requested enhancements and feature software acceleration derived from the new Mercury Graphics Engine, which is fine-tuned for 64-bit, multicore Mac systems. Photoshop CS6 has undergone an interface redesign that touts a streamlined presentation on a fresh dark theme. The program extends its slate of content-aware tools to include two new components: Content Aware Patch options and the Content Aware Move tool, alongside a gallery of new blur effects, a non-destructive crop tool, and a new Adaptive Wide Angle lens correction tool. Photoshop's layers technology has also been overhauled in this version. With Photoshop CS6, vector layers now, for the first time, allow users to apply dashed lines and gradient strokes. Searchable layers help users quickly find the specific layers they seek. New type styles let designers quickly apply type treatments to their designs. Photoshop CS6 is also home to improved, more intelligent auto corrections built on a database of corrections to similar images. New painting features such as erodible brush tips, a brand new GPU-accelerated Oil Paint filter, skin tone aware selection and masking, and intuitive video creation are other new features available in this upgrade. 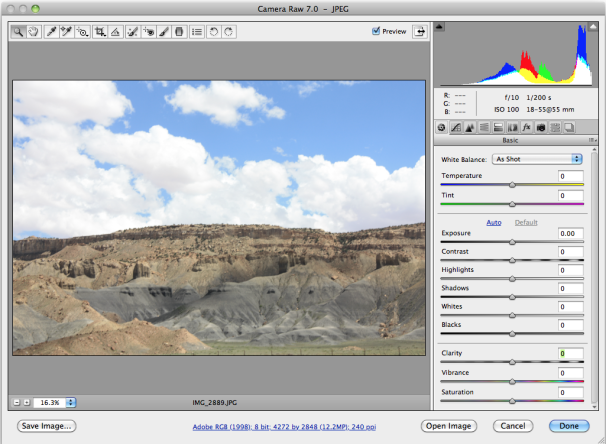 Camera Raw 7, which first appeared in Photoshop Lightroom 4, will also be included as a plug-in to Photoshop CS6, offering new, easier-to-use controls. New interface features a dark background and streamlined icons. 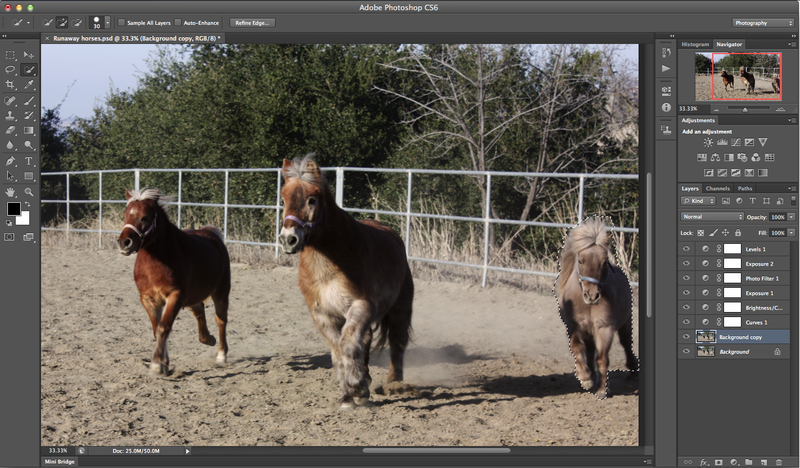 More than ever, Adobe is linking the Photoshop CS6 release to related content creation applications, both inside and outside of the suite. For example, Photoshop takes some cues from the recently released Photoshop Lightroom 4 photo management tool, particularly with features like Background Save and Auto Recovery and Preset Migration and Sharing. The save and recovery feature is a non-intrusive way for the program to back up and save precious work. The preset migration function enables users who upgrade from previous versions of the software to easily move all of their favorite settings, workspaces, and tool presets to the new version intact, without having to re-create them. Photoshop CS6 will feature Adobe's new Mercury Graphics Engine, which takes advantage of the graphics processor (GPU) rather than the main computer chip (CPU) to speed up processor-intensive functions. The Mercury Graphics system works with a wide variety of graphics processors so that Photoshop users—especially those working with the 3D-capable extended version—will derive its benefits. Adobe says that the Mercury system hastens performance for tools such as Liquify, Puppet Warp, Transform, and Lighting Effects. Photoshop CS6 Extended will include all of the improvements contained in the standard program. However, it will also feature more intuitive 3D controls than the previous version, offering new on-canvas and in-context scene editing, reflections and dragable shadows, easy alignment and distribution of 3D objects, and faster Ray Trace rendering. The Extended version also offers improved quantitative imaging analysis capabilities. The final shipping versions of Photoshop CS6 and Photoshop CS6 Extended will be available for purchase as standalone products, as components of the Adobe Creative Suite family, and as part of the Adobe Creative Cloud offering. The exact date has not yet been announced. Photoshop CS6 and Bridge CS6 are compatible with multicore Intel processor Macs from 2006 and later and are compatible with OS X 10.6.8 and 10.7 or higher. Adobe said it is working with Apple to make the Creative Suite and Photoshop CS6 compatible with Mountain Lion, the Apple OS upgrade that will also be released sometime around the summer. In a switch from past anti-piracy practices, which have aggravated some users, Adobe has decided to ease registration procedures for its customers with the CS6 suite. With this version, all CS6 programs will associate serial numbers to a user’s Adobe ID, instead of just the computer the program is installed on. The Camera Raw plug-in derives new controls from Lightroom. Notice the new Shadows and Highlights sliders. With Creative Cloud, users will be able to download all of Adobe’s upcoming Creative Suite 6 tools, including Photoshop CS6, as well as new applications like Edge, Muse, and new mobile Photoshop Touch Apps. Adobe envisions Creative Cloud as a community hub that will share best practices, showcase work, and build connections. New cloud-based services will evolve over time to assist users in content creation and mobile publishing across platforms and devices. Customers can submit Photoshop CS6 feedback via the community site or via the forum. Users can also connect with the Photoshop team on Facebook, YouTube, the Photoshop.com blog, or via Twitter. Meantime, check out Macworld's Photoshop CS6 First Look, which gives the lowdown on the new features introduced in the beta release of Photoshop CS6.